Taking on a spice organization project is a quick way to add a dash of organizational bliss to your kitchen. Toss in a new spice storage system, add some labels, and suddenly making dinner is a pinch easier and a dash tastier than before! 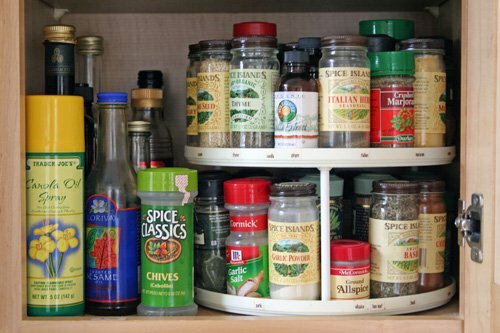 Here’s how to organize your spice cabinet in four simple steps. Select a sorting scheme for your spices, such as alphabetical, sweet and savory, regular use and specialty use, or individual spices versus spice blends. Sort your spices in a way that will make them easier to access while cooking or baking. Once you’ve selected your sorting scheme, pull all of your spices out of your spice cabinet or drawer, and start sorting. If you discover you have four jars of basil or caraway seed from the early ‘90s, now is the time to edit. Pitch expired spices, consolidate half-full bottles, and donate unopened and unneeded spices to your local food pantry. Next, evaluate your spice storage system. Does it allow you to easily see and access your spices? If not, consider upgrading with a new spice organizer. 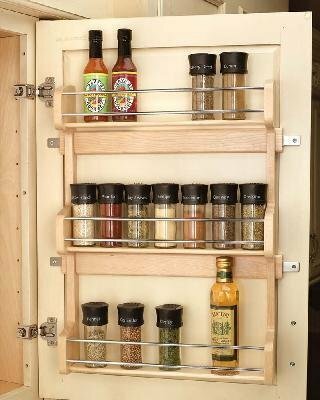 Start by considering the primary storage location for your spices (cabinet, drawer, or counter) and then seek out a spice organizer that will keep your spices in sight and in-reach. For example, if your primary storage location is a cupboard, consider using a lazy Susan or a door-mounted spice rack. If you store your spices in a kitchen drawer, look for a drawer organizer designed for spices. 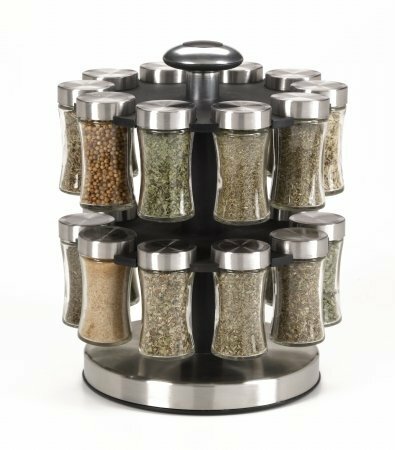 Finally, if you keep your spices on the kitchen counter, a spice rack or lazy Susan is a terrific option for you. If your storage arrangement doesn’t make it easy to distinguish your basil from your bay leaves, add labels. If you’re using a lazy Susan, you could add labels to the side of the turntable. Or, if you store your spices in a drawer, it could make sense to label the tops of your spice bottles. Add labels if it will make it easier to find your spices or put them back in the right spot after cooking. All that’s left to do now is stand back and admire your freshly organized spices—and, of course, enjoy them in your favorite meals! Where do you store your spices? What type of spice organizer do you prefer? Thanks for sharing your thoughts in the comments below! Do you have any ideas for those of us who dry our own herbs? This time of year I don’t have too much, but at the end of the summer I’ll have tons of dried oregano, thyme, basil, etc. I usually put them in brown paper lunch bags with the name of the herb just handwritten on it. Brown paper works because it’s best to keep the herbs on the stem and crumble just before putting them into a recipe. But it’s a pretty ugly solution to see at the top of my kitchen cabinet. Any better ideas? Needs to be kept dry and mostly closed but not have a risk of condensation getting inside. Any ideas? I store my home dried herbs and spices in mason jars with plastic lids. It works fabulously! You can get the lids on Amazon. Thanks for your question. What if you put the paper bags in a pretty basket? It sounds like the paper bags are a terrific solution in terms of providing the right climate for the dried spices…and the basket would make conceal the bags. For an inexpensive basket use a paper bag as a “basket”. Carefully fold the edges down (like making cuffs for your pant legs) . Use a heavier paper grocery bag to make your basket…then small lunch bags to store your dried herbs. You could place them in sideways so you could easily read labels. Donna’s idea of using a paper bag as a “basket” is a great idea especially because I tend to take some time finding the “perfect” basket. This way, I can start using the system and make it perfect when I get that basket! A great temporary but immediate solution! I LOVE Done! Just what I needed! This month, we added cupboards to some unused space in our kitchen to create a baking center, and I’ve waited over a week to bring my spices over because I haven’t known how to store them. I’m glad to know that it’s okay to continue using my *old* Lazy Susan from my early-marriage days! I found some awesome label templates at http://images.marthastewart.com/images/content/web/pdfs/pdf3/spicejar_labels.pdf. They are set up for both the sides and tops of the spice jars. Just print them onto self-adhesive paper, cut them out, and adhere. Thanks for the link, Anne. And yes…it’s always okay to use what works, even if it’s old. I’ve never used labels like this before. Can you tell me how to use them? I see they provide blanks but not sure how to enter my text to create my own labels. These are adorable! Thank you! Great idea Heather! Thanks for sharing the link! Yes, my dear. That’s exactly it. You lose track of . . . time. But now, with my spices organized, I can save some! We are getting ready to move into a new home and our gas stove/oven is in the kitchen island. It has a door on either side that doesn’t get use and I would love to put pull out spice racks or over the door racks to utilize that space. My question is can I store the spices that close to the stove as I’m sure with the oven going it will heat up pretty fast down there and not sure how it will affect the spices. Anyone? Also, on the topic of the paper bag basket, I have a great pattern for a fabric/paperbag basket. They are time consuming to make but very simple and great for a rainy day project. Technically it is recommended that spices are stored in cool, dry spaces. However, I store my spices right next to my stove. It is an upper cabinet and I have kept them there for years and it has worked out fine. Maybe you could put a thermometer down there after you move in and check it when you use the stove and oven to see how hot it gets…and then decide. My biggest problem is living alone and my spices get old, but I don’t know how long each one lasts nor which ones should go in the refrigerator. Any help? I like to store mine in the cabinet by the stove as well. We put ours in a shoebox we can slide out and peek into. This means I’m not digging through the cabinet rearranging the bottles every time and we can return spices to the same spot . I would like to label them to make them even easier to find. What will work as adhesive labels for those little bottles? I would like it to be a label that fits on the top of the bottle. I’ve just started cooking and spices would get lost taking the fun out of the experience. The door shelves were an excellent idea. So simple now why didn’t I think of it. Thanks for the idea.